I posted some iPhone photos from this trip last year shortly after returning, but today I’d like to share some film photos from the day we spent on the Alpine Loop National Back Country Byway in southwestern Colorado, and a lot more description about the sites and sights along the way. 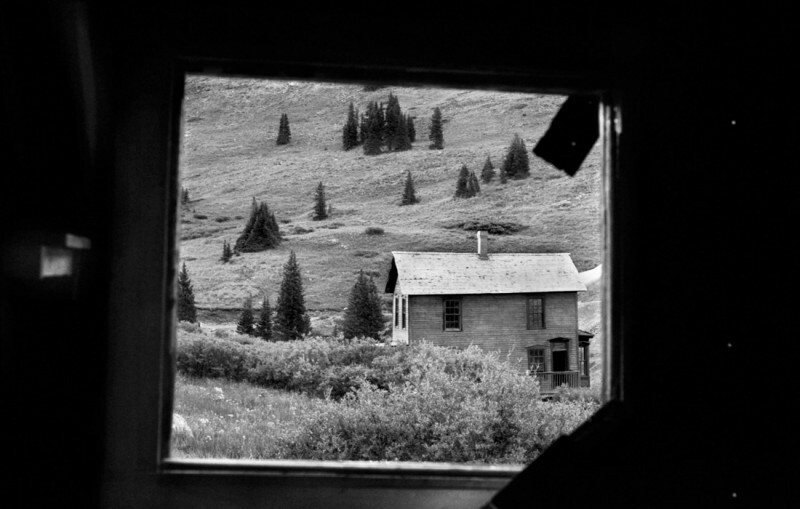 Colorado’s Alpine Loop National Back Country Byway was designated Sept. 22, 1989 — months after the creation of the National Back Country Byway system — and serves hundreds of thousands of visitors each year seeking ghost towns and mines, great views and history. The loop is comprised of about 65 miles of interconnected county and forest roads between Lake City, Silverton and Ouray. Exploring the routes can take you to dozens of historic town sites and mine ruins, and over two 12,000-foot-plus high mountain passes with views of at least five nearby 14ers. Another dozen or so 14ers and passes are easily accessible in the surrounding area. We started out in Lake City, on the east side of the loop, and made a circuit over Engineer and Cinnamon passes and back to Lake City, spending the entire day exploring during our drive. Not far up the valley from Lake City — about 3.5 miles west — the Ute-Ulay mine and Henson townsite straddle Lake County Road 20. 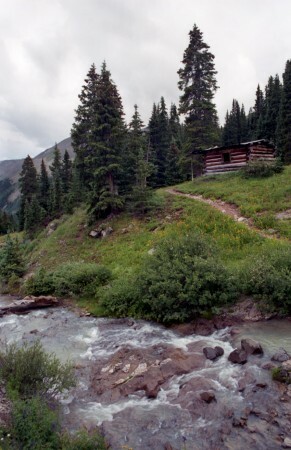 The Ute-Ulay, begun at the mouth of Ute Creek in 1874, was the first patented mining claim in Hinsdale County. Lake City grew up around supporting the mine, though early miners lived in the town of Henson next to the mill. In the fall of 2012, two mine tunnels were safely closed and the headframe was stabilized, and a number of environmental remediation projects were completed. There are some interesting videos about the remediation efforts on Youtube. In April 2013, the 12-acre mill and mine site was donated by owner LKA Gold to Hinsdale County. Near the mine on Henson Creek, which the Alpine Loop follows along Lake County Road for much of the way to Engineer Pass, stand the remains of Henson Creek Dam No. 2., which helped provide the mine operation with water and the mill with hydroelectric power. From the side of the road along a curve just west of the mine you can look down into the narrow gorge and see the damage where about half of the dam’s vertical height was washed away after it failed in 1973. There’s an iPhone photo of the dam in my August, 2014 post. East toward Lake City stands the Hidden Treasure Dam, crumbling as well. It provided power and water for the Hidden Treasure Tunnel mining operation until it failed. 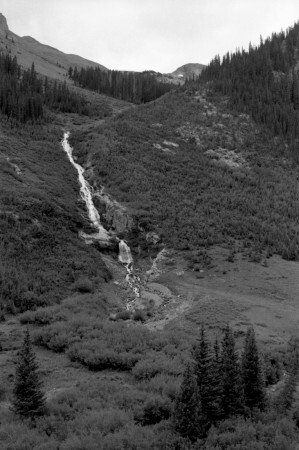 The Henson Creek watershed is comprised of the Henson Creek valley, Yellowstone Gulch (in which flows the North Fork Henson Creek) and numerous side gulches. Even in early August, snow from high basins continues to melt and feed runoff into the creek, some in trickling rivulets and some in raging torrents and falls. The trick on a trip like this, I think, is to get out of the car often and smell the rarified mountain air. Beyond stretching one’s legs (always welcome), you can’t just drive straight through. Why did you come, if not to stand in those pioneering miners’ footsteps and see the high vistas? I don’t spend the whole time looking for photo opportunities, either. You’ll notice I talk about a lot of things I don’t have photos of. Sometimes I took photos that just didn’t come out, but sometimes I simply left the camera in the car. The best version of any photo is usually the one inside your head (this may be why unexpected results draw many people to film photography). Just before you reach Capitol City a fork in the road leads up Yellowstone Gulch — a wide, steep draw that heads toward the base of Wetterhorn Peak. Initially you’ll gain a good bit of altitude pretty quickly and find some good views back into the Henson Creek valley and up to the peaks above and beyond it. The valley here is mostly covered in dense, mature quaking aspen. 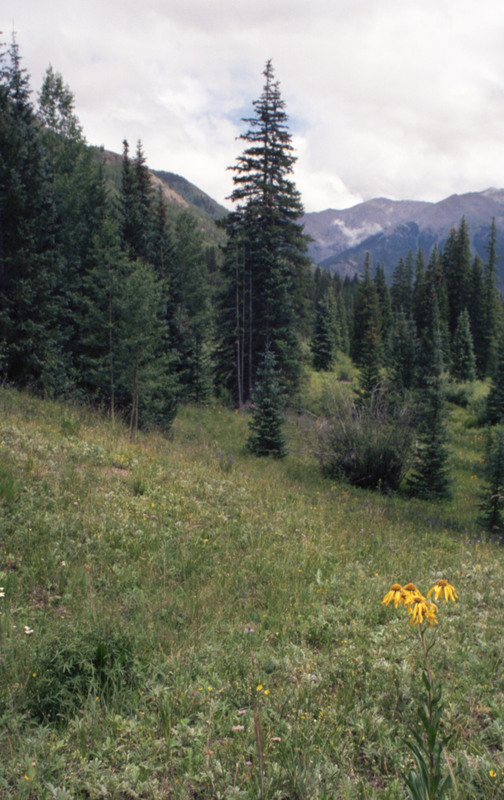 Aspen trees grow quickly and spread rapidly from their underground network of interconnected root systems, and they are sun-hungry plants. Wide swaths of mature aspens in Colorado often indicate areas where old growth pine forests have been previously wiped out — usually by fire. This valley could have been logged out for the construction of nearby Capitol City, but the tall pines interspersed with the aspens and lack of stumps leads me to believe that’s not the case here. 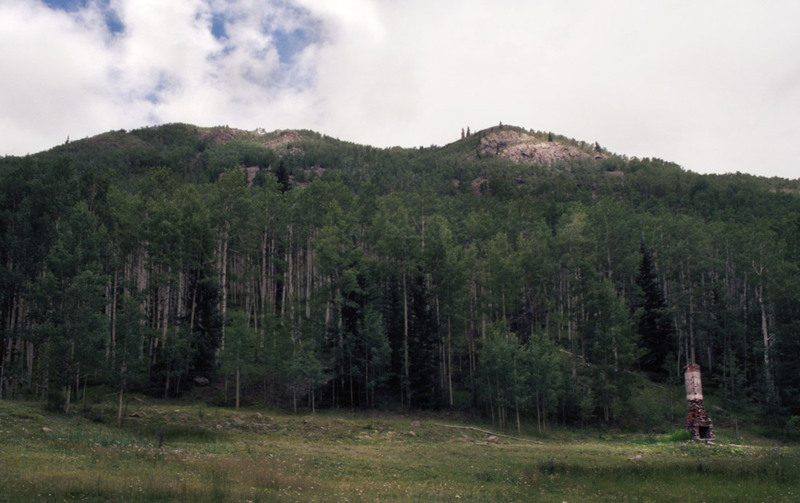 Avalanches and landslides can also knock out the older pines and make way for aspens, though avalanches tend to recur often enough to prevent the aspens from growing so densely. I didn’t see any evidence of a massive slide or slump that would’ve taken the pines out, and don’t see any looking at satellite imagery. 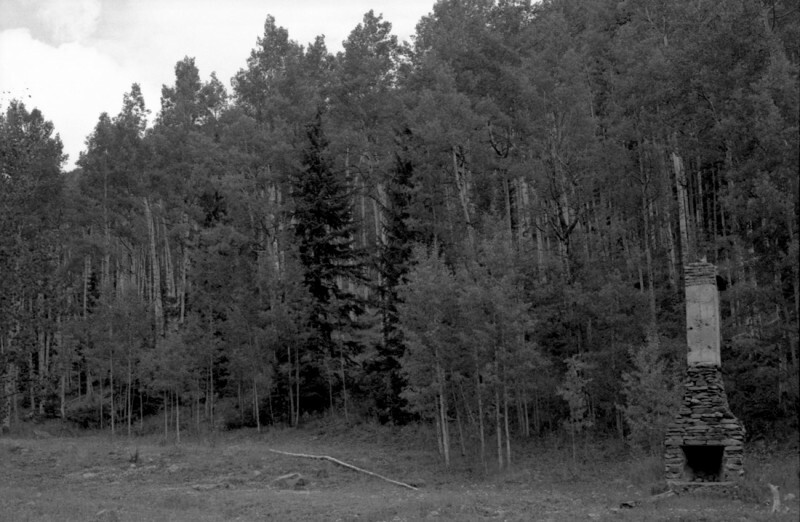 Once again, the remaining pines strewn throughout the aspen forest speak against such an event, leaving me to believe the pine forest was likely destroyed by a wildfire. The apparent age of the aspen indicates the fire was probably at least 30 years ago. The lonely chimney we found in a clearing just off the road seems to be a further indicator of a forest fire, the cabin or building it was once a part of, or the ruins thereof, probably having been destroyed at that time. The hearth and fireplace were built of local stone, as was the top of the chimney. In between a span of concrete clearly poured in rough plank forms leads me to believe it was probably constructed in the 1930s or 1940s. Black stains on the chimney could indicate smoke, though they were weathered enough that I couldn’t identify them more positively. Not much further up the valley the road becomes less distinct and switchbacks steeply up the hill, at which point we turned around and headed back to the Alpine Loop. Founded in 1877 as Galena City, prominent resident George S. Lee lobbied successfully to rename the town Capitol City. Though he dreamed of the town becoming the capitol of the newly-admitted state of Colorado (and of being its governor, apparently), it was not to be. The town was never even the county seat and dissolved quickly after the silver crash in 1893. East of the sparse townsite, a tall smelter stack of pink brick is all that remains of Lee’s lime furnace, and across the valley floor to the south a large brick kiln remain visible. On the north side of the valley floor, at the confluence of Henson and North Fork Henson creeks, lies the crumbling foundation of a sawmill. Though nearly everything has been destroyed or dismantled, the original U.S. Post Office still stands next to the road. The post office was stabilized and partially restored in 1992 by the BLM and Hinsdale County Historical Society, removing a fallen shed on the east side and replacing the building’s collapsed roof. Behind the post office is a ramshackle bunkhouse once used by postal carriers who ferried mail up and down the valley on horseback. The bunkhouse is in worse shape, though it retains a rusty corrugated steel roof and weather-beaten plywood door that appear to hold much of the harsh snow at bay. Little else visible remains of the once-ambitious town, now home to a couple of modern cabins. Lee’s famously expansive brick governor’s mansion is long gone. 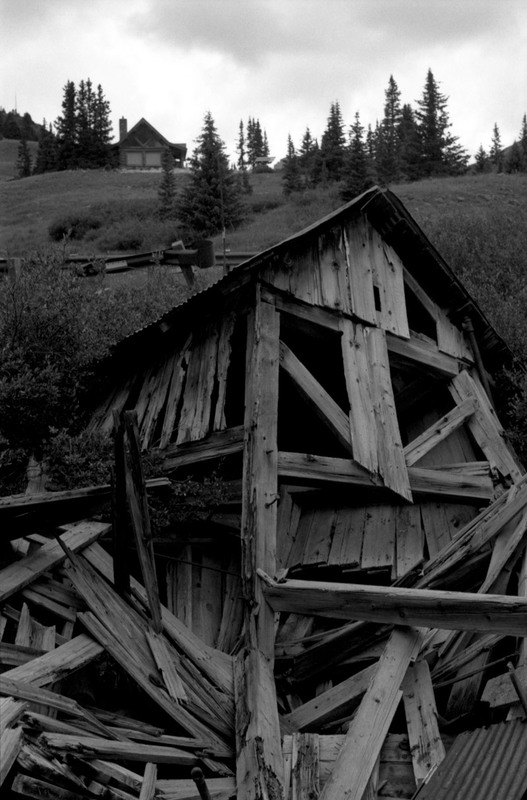 It was not uncommon for buildings to be torn down for reclaimed timber in Colorado’s mining booms — cutting fresh boards and transporting timber over short-season mountain passes was expensive. Fire, too, frequently destroyed mining camps. The bottom of the deep valley has long been cut down to bedrock, and Henson Creek has further sliced into the hard rock in the Silverton volcanic series to form deep, narrow gorges. In some places I estimated the depth at as much as 70 or 80 feet, with the walls sometimes only a couple yards apart. 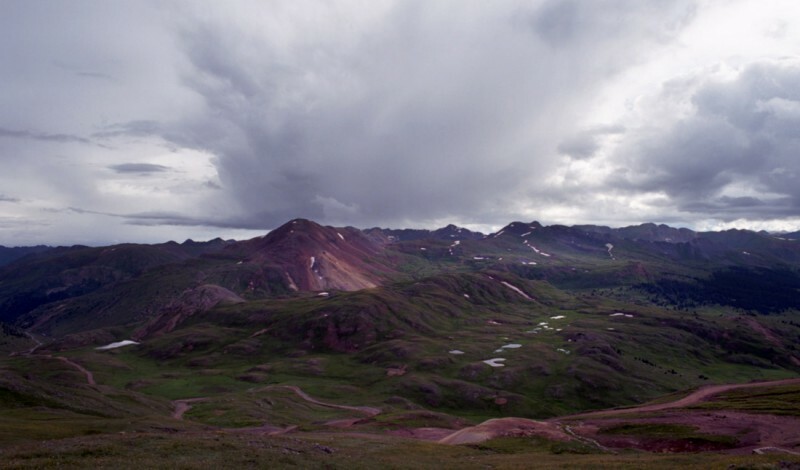 The Picayune volcanic group is composed of andesite, latite and rhyolite “in chaotic relations” and underlies the entire Henson Creek watershed. One such narrow gorge ends abruptly in Whitmore Falls, just a short hike downhill from the road. 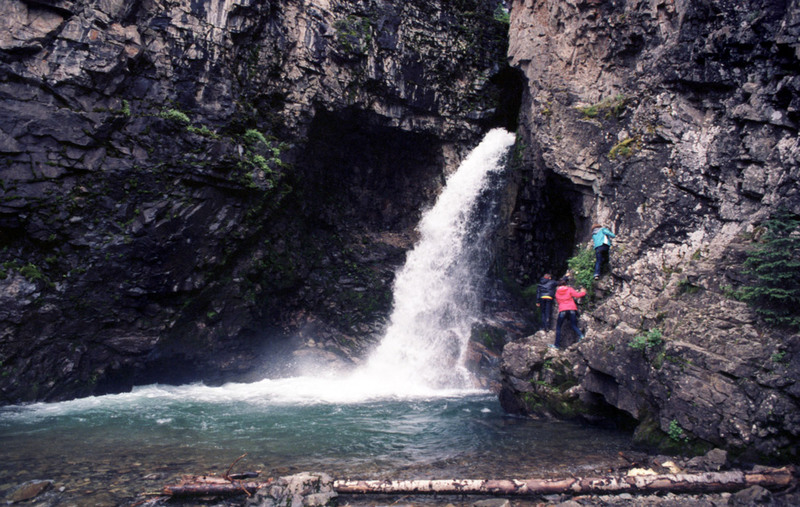 The power of centuries or millennia of crashing water has carved a wide exit from the narrow slot and a deep plungepool at the base of the falls, despite the drop being only 15 or 20 feet. The almost parabolic grotto surrounding the falls amplifies and projects the near-deafening roar of the water’s patient and unrelenting assault on the rock. I’m no geologist, but it looks like softer latite and rhyolite members have been incised by the creek, but a harder andesite member resisted erosion, creating a waterfall. The gorge isn’t long, either — just through a few hundred yards of country rock along a narrow in the valley at the base of Sunshine Mountain. Just a few yards downstream the water calms and flows between boulders it has carried from the mouth of the gorge and which will inevitably shift or disintegrate further with each year’s meltwater surge. 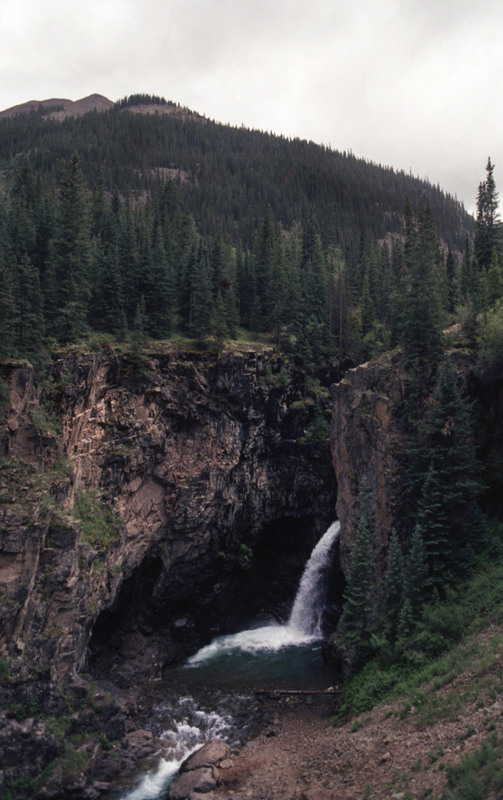 Along the banks, large rocks shaded by tall spruce trees sit between lapping eddies in the creek, making good seats for a rest as the thunder of the falls begins to recede. As the road becomes steeper, the far side of the valley and Seigal and Wood mountains close in. Runoff from the Horseshoe Basin near Wood Mountain pours down draws to feed Henson Creek. We pulled over where a particularly fierce stream crashed down the hill in an obvious avalanche chute. The road isn’t crowded, but the area isn’t deserted, either. Nevertheless it’s a far cry from being in the city. We spent an entire day on our drive because we didn’t spend the whole time stuck in the car. 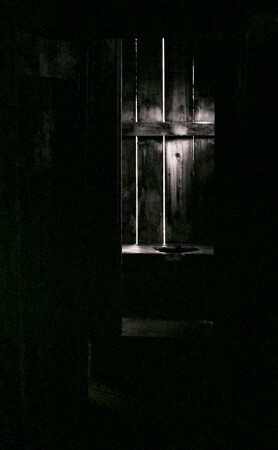 I took my Nikon bag and the Voigtlander Bessa I and left everything else at home. The color photos you see here were all taken with a Nikon FM2n loaded with Kodak Ektar 100. 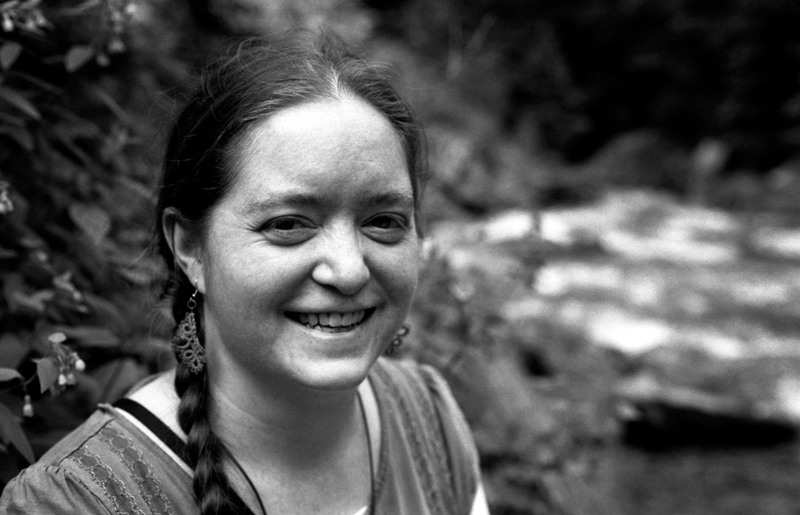 The black and white were shot with my Nikon F3, almost exclusively using a 50mm f/2 with a Nikon Y44 (pale yellow) filter, and Kodak Plus-X 125 film. I hoped the Y44 filter would darken up the skies just a tad but I didn’t take into account how much of an effect it would have on the dark green pine and spruce trees. Don’t get me wrong, I’m very pleased with how it darkened them, too; I just hadn’t planned for it. Ultimately I think the yellow filter served well to highlight the things I was hoping to bring out in these photos — the dense forests and the crumbling structures of the mines and ghost towns peppered throughout. Further beyond Whitmore Falls the road crosses a tailings pile with a collapsed headframe structure before winding higher up the narrowing valley. In this area was once a stage stop called Rose’s Cabin. 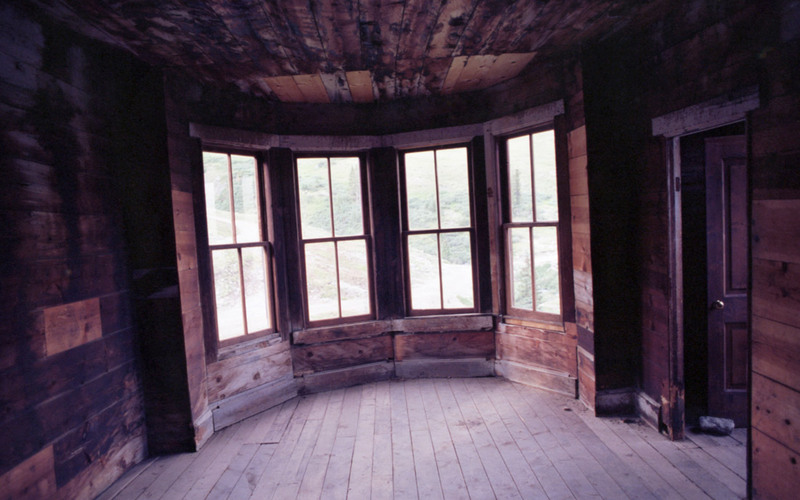 Rose’s Cabin began as a single-story inn built by Corydon Rose with a long bar and faro table. Otto Mears’ toll road connecting Lake City, Ouray and Animas Forks ran just past Rose’s Cabin and it became a popular layover where drivers swapped horses at Rose’s large livery stable. Soon a post office and more cabins surrounded Rose’s, though today the only remains are part of Rose’s stable and the rusted remains of the postmaster’s safe. 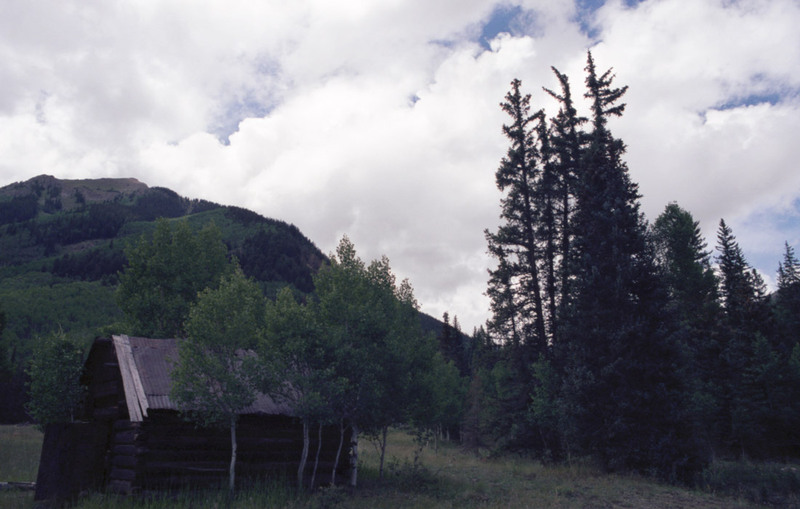 Like the rest of the area, the town declined rapidly after the silver crash in 1893, and was abandoned by about 1900. By 1963, little remained. Just below the treeline, high up on the east side of Engineer Pass, is a lonely modern cabin perched next to a fissure in the rock that is spanned by a narrow suspension footbridge. Called Thoreau’s Cabin, it was built in 1994 utilizing full round log construction and features 936 square feet on 5 acres, with solar power, propane appliances and deep-well water. It appears to be up for sale, fully furnished, for $575,000. Right across the road from the property is a collapsed or plugged shaft with a fallen-down structure somewhat atop it. I suspect this was a pump house, possibly for the Hough Mine higher up the side of Engineer Mountain. The material around the top of the shaft and collapsed into it appeared to be rock that was removed when the shaft was sunk, and it seemed solid despite the depression in the center that had obviously swallowed some of the mostly-destroyed building. I explored the ruin briefly but stuck to stepping on solid timbers and previously trodden ground. Around a bend, a few yards further up the hill, and only a few yards below the treeline, a tiny cabin in reasonably good repair stands on a hill across the creek fork. We found a line of rocks to ford the creek without soaking our shoes, then followed the short path to the cabin and looked around. The asphalt-shingle roof looks old, but I suspect it dates to sometime around the mid-20th century. Inside we could see that the inner faces of the timbers are covered with names and dates, some going back as far as the 1960s. 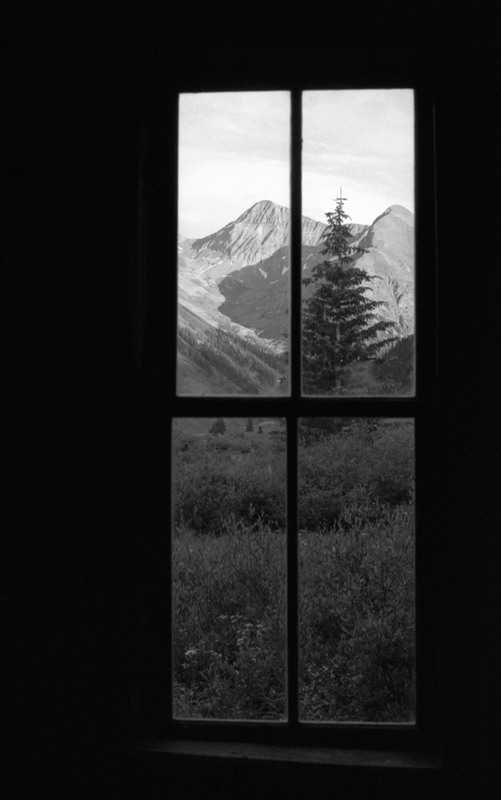 Though there is no door and the windows are just open, it felt like it could have been a cozy refuge from the lonely alpine meadows at its 11,500-foot elevation. The roof is low — I could just barely stand up with my head immediately to either side of the ridge pole. The view from the sparsely-treed promontory was spectacular and the hillside was covered in wildflowers, their short-lived red and yellow blossoms begging for bees to visit. Beyond the unnamed cabin the trail starts to switchback and high clearance becomes more important. You’ll pass the Frank Hough Mine, one of several owned by Rose’s Cabin resident John Hough and named for his son. A BLM sign indicates the mine closed in 1900, though I found some indications the former mine later produced uranium in addition to its original silver, copper, lead, zinc, and tellurium. 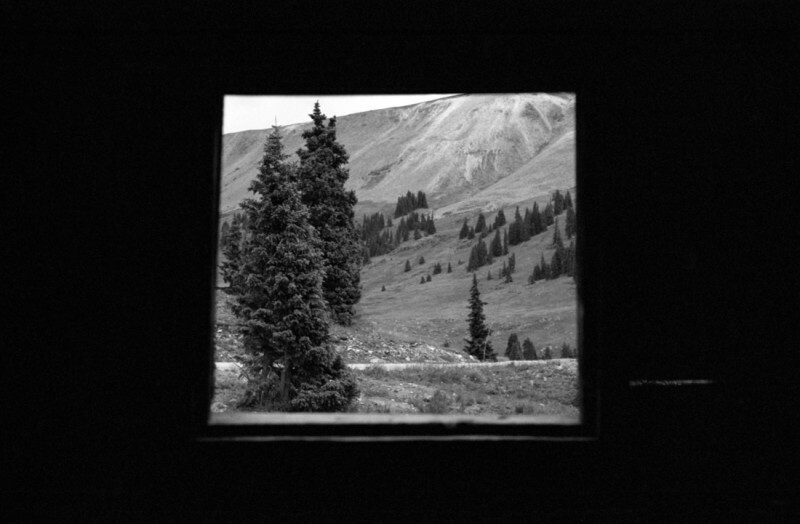 Just past the Hough Mine, the summit is windy, rocky and desolate — as mountain passes in the Colorado Rockies tend to be. Coming down the west side of the pass the road quickly turns south and back east again. A vast alpine meadow spreads out with the red summit of Houghton Mountain in the distance. Multiple forks in the road offer side trips or exits to other town sites, or down the hill to Ouray or Silverton. 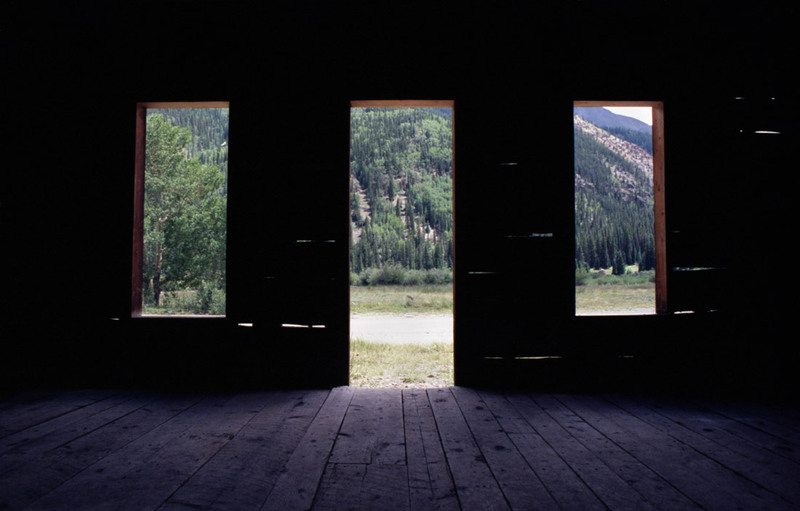 We headed toward one of Colorado’s most-visited ghost towns — Animas Forks. Founded in 1873 at the confluence of the streams that form the Animas River, the town called Three Forks of the Animas was renamed simply Animas Forks when the U.S. Post Office moved in. It’s just about dead center between Engineer and Cinnamon passes. Among the handful of remaining buildings is the 1906 Gustavson home, well-known for its attached (it’s not quite “indoor”) outhouse, and the “hip roof” boarding house. In 1879 William Duncan built the town’s most well-known home with its characteristic bay window. The house was later bought by miner Thomas Walsh, discoverer of the Camp Bird Gold Mine near Ouray, for his daughter Evalyn. She probably never lived in the house, though, as she eloped with the heir to the Washington Post fortune, Edward Beale McLean, in 1908. Walsh famously bought the Hope Diamond from Pierre Cartier in 1908 for $180,000 as a wedding present for Evalyn, and the socialite was the last private owner of the gem. A few other cabins and outbuildings, as well as the town’s oldest building — the jail — round out the site. The jail was constructed in a board-on-board style that stacked planks with interleaved ends at the corners for dense, heavy walls that would be extremely difficult to crash through even today. A flat roof installed by early restoration efforts in the mid-1990s, after the jail stood roofless for 60 or 70 years, was recently replaced with a gabled roof built in the same board-on-board style matching the original design. By 1883 the town boasted about 450 residents, though most reportedly moved downhill to Silverton during the harsh winters. When a massive fire claimed about half the town’s structures in 1891 the mines were already closing and Animas Forks declined rapidly. In 1904 the Gold Prince Mill was constructed and the Silverton Northern Railroad brought its narrow-gauge track up the Animas River Valley. The resurgence was short-lived, though, with the milling operation ceasing just six years later and the bulk of the mill disassembled and moved to Eureka in 1917. Many of the town’s remaining buildings were destroyed in 1913 by a second devastating fire. The post office closed in 1915 and by the 1920s the town was deserted. Avalanches have reportedly claimed other structures that survived the fires (and ruins of those that didn’t) in the years since. We spent an hour or so climbing through the stabilized and repaired buildings and reading the various signs and plaques. The number and quality of signs in historic areas maintained by the BLM has impressed me over the last few years; since family outings in the 1980s and early 1990s, they seem to have improved dramatically. While various historical societies and the BLM have worked to save the character of the town, repairing collapsed roofs, windows and siding to keep out the elements, and stabilizing foundations to prevent injuries to tourists and explorers, I have mixed feelings about the effect. These kinds of preservation efforts aren’t new, but the extend to which they are carried out seems to be increasing as time passes. Something of the obvious age and the effects of time and climate is lost when structures are rebuilt, although I know the town’s buildings would soon be lost without some attention. I am happy to report that much of the age appears still present in Animas Forks, with plenty of structures out of square, leaning or sloping. They are still far from habitable. I can’t honestly decide if I would prefer to see these things in their improved form, or see them fall into memory with all the other lost cabins and stables that once filled the valleys of the Rocky Mountains. The freedom to explore the remains of the town with the blessing of the BLM is great, though, and around 400,000 people come to enjoy the history each year, according to the San Juan County Historical Society. Leaving Animas Forks you can head to California and Hurricane passes by taking the road almost directly west out of town, past the Columbus Mine — the small mine across the creek from the Walsh house. On the way you will pass the Bagley Tunnel and Frisco Mill, and have access to the Gold Prince, Gold Queen and Mountain Queen mines. Heading south out of town will take you to the Eureka, Middleton, and Howardsville townsites, and on to Silverton. Turning back to the north and heading uphill from Animas Forks, Lake County Road 5 leads up to Cinnamon Pass and, eventually, back to Lake City. I somewhat regret not continuing the journey on the Ouray and Silverton side of the loop, but I suppose I’ll have to come at that area the other way some time. Cinnamon Pass itself is primarily about the views, with Handies, Sunshine and Redcloud peaks — all 14ers — visible to the east beyond the vast expanse of American Basin. In the middle of the basin at almost 13,000 feet of altitude is icy Sloan Lake. A dozen or so 13,000-foot (or nearly) peaks are visible to the south and west across Grouse and Burns gulches. Heading down the east side of Cinnamon Pass, almost straight toward Whitecross Mountain, you’ll find the road and the Lake Fork Gunnison River at the base of Handies Peak. We followed the road east and down the Lake Fork valley. A mile or so downhill from the summit is the ruined Tabasco Mill. Not much to look at. There are some more mine remains just across the river and over a wooden bridge, though I believe they are on private property. On down the hill a few more miles, a wide spot in the road marks the Grizzly Gulch and Silver Creek trailheads. There are some mine and cabin remains nearby, and an outhouse if you need it. The parking areas are probably full and there are likely tents pitched around. Narrow avalanche chutes stripe the steep valley walls as you continue downhill, passing occasional modern cabins. The Lake Fork valley opens up suddenly into the wider Cottonwood Creek valley and a short jaunt of the right fork of the road leads to Sherman. There’s sadly little left of the town, much of which may have been washed away by floods or a dam break. 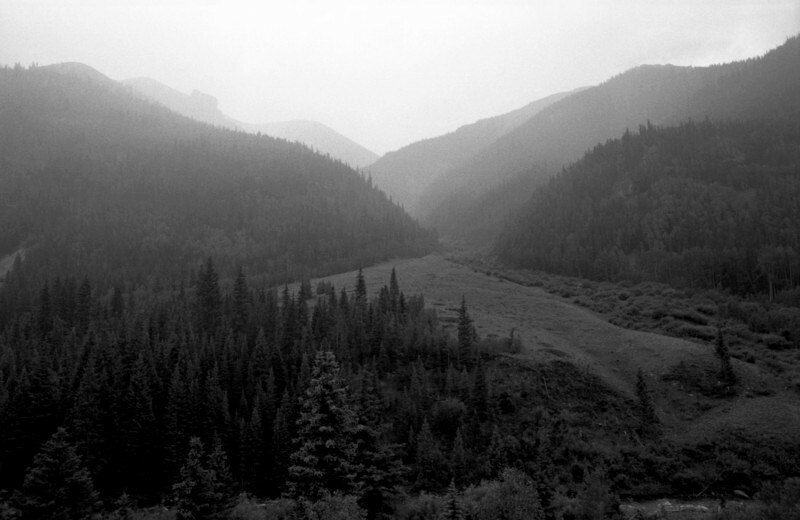 The town was at the confluence of the Lake Fork Gunnison River and Cottonwood Creek, and its life cycle roughly matched that of Animas Forks, having been founded in 1877 and deserted by 1925. The village’s fortunes rose and fell on the back of the Black Wonder Mill in town. Much of what remains is fairly hidden in the dense forest, and the area has a lot of private properties and modern cabins. After Sherman, the road quality improves dramatically and the valley sides are dotted with modern, private cabins. The road passes Lake San Cristobal and returns to Colorado Highway 149 south of Lake City. We visited some other places in the Powderhorn Valley area, Gunnison and Mosquito Pass on the same trip. I’ll post more photos from the trip soon. If you’re interested in the geology of the area, I found some amazing resources in old publications from the United States Geological Survey, including this gorgeous plate of the lower Henson Creek watershed from Capitol City to Lake City. I lifted this single plate as a PDF, or you can read all about it in the 1911 USGS report, “Geology and Ore Deposits Near Lake City, Colorado” by John Duer Irving and Howland Bancroft.